By placing an order on this web site, you indicate that you have read and agree to the following cancellation and return policies and conditions. Click here to read our web site Terms and Conditions. All Returns Must Be Authorized and a RMA Issued. 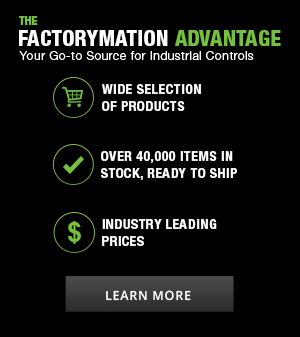 RMA’s may be requested from our Returns Department via e-mails addressed to returns@factorymation.com or through our Customer Support Team @ (800) 972-0436. Products that are returned without an appropriate RMA number will not be accepted and returned to the sender at sender’s expense. Any non-warranty returns must be unopened, unblemished, and unused and returned to our Returns Warehouse within 30 days from order fulfillment. Unopened and unused products may be returned for credit only after completion of the required RMA procedure. All returns will be inspected upon arrival (refer to Returns Applicable Criteria for more details) at the Returns Warehouse. Unopened products that meet all of the applicable criteria may be subject to a 20% restocking fee. The customer is responsible for all shipping fees associated with returns including any applicable freight allowed costs from original order. Some products such as fuses and special order products are not eligible for non-warranty returns. Factorymation LLC is not the manufacturer of the products that it sells and makes no expressed or implied warranties whatsoever and disclaims any thereof, and all products are sold “As Is, Where Is.” We will, however, assist the buyer in the warranty claim process. A valid RMA must first be obtained for all warranty returns. Upon receipt of the returned product, Factorymation LLC will process the return per the applicable manufacturer’s warranty procedures, which can take as long as 60 days to process. If the manufacturer deems the return a failure under warranty, the item will be repaired or credited at their discretion. Credit for the returned product will only be issued if and when the manufacturer has deemed the return a failure under warranty. If replacement is required for an item credited under warranty, a new order must be placed. The customer is responsible for all shipping fees associated with returns. Non-standard and custom products are non-cancelable and non-returnable. Non-standard or custom products are defined as products that are special orders, custom orders, orders built to customers specifications, products not customarily in stock, or orders for value-added products. If your returned product does not match all applicable criteria listed below, it will be rejected by our Returns Warehouse and returned back to you. Consequently, your RMA will be nullified and any credit request will be denied. Original packaging (manufacturer's box, styrofoam, plastic bags, etc.). Original packaging must not be marked or damaged in any way. The RMA number must not be written on the original manufacturer's packaging or box. Please write the RMA number on the label used to return the item or on the brown shipping box. Items received with any writing on the original manufacturer's packaging or box will be refused and returned to you without credit approval. Unless otherwise stated, you have 30 days from the date your product left the warehouse (regardless of when you actually took delivery of the product) to obtain a valid RMA and get your product to a shipper to return back to us. It does not have to be back in our warehouse within 30 days, but it does have to be in the possession of the shipper (along with the valid RMA). 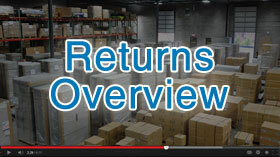 Return Merchandise Authorizations (RMAs) must be valid, unexpired, and issued for the product being returned. RMAs are valid only within the 30 day timeline specified in the Basic Return Policy or the shorter timelines specified in the Special Return Policies above, whichever is shorter. Only one RMA is issued per return. When it expires, you may no longer return your product. Software Downloads may not be returned.